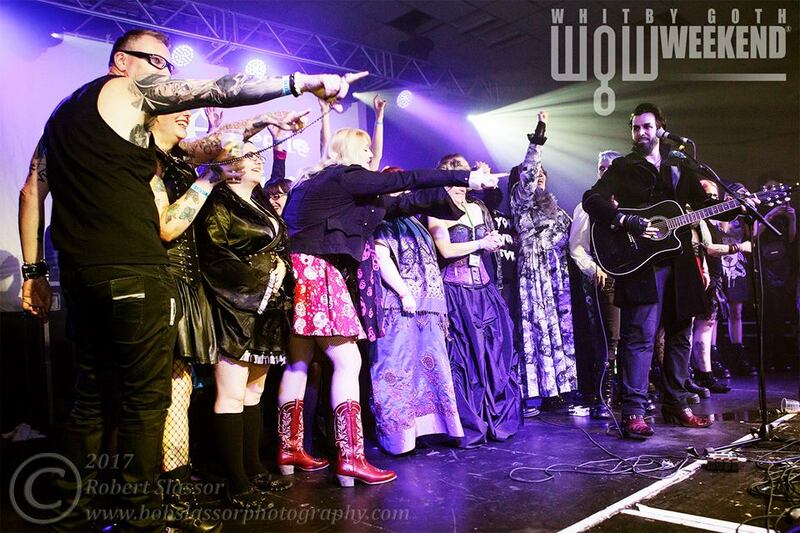 Welcome to The Blogging Goth’s biannual review of Whitby Goth Weekend! I’ve already covered Friday’s line-up in a previous post, so make sure you are all caught up to now! We go crashing into Saturday with… a heartfelt apologies. Despite doing this job for several Goth Weekends I completely messed-up the timings. I will politely hand over to my talented colleague Jordan Mooney of Cat On The Wall Zine who was on time and caught the opening act, Magic Eight Ball, to do my job for me! Sincerest apologies all round. I’m finally stage left, and already a song or two into the set by fabulously named London steamPUNKS, “The Men That Will Not Be Blamed For Nothing“. These canny lads know their audience, and have included songs about coffins – well, who’d have thought you’d like that? Lead singer Andy Heintz should know of course – he was in anarcho-goth band Creaming Jesus back in the day! These guys have amazing, angry presence, and when stage technicians must suddenly rescue Jez’ drum-kit from spontaneous combustion, they are utterly unflappable. I must also observe that Andy’s voice is gorgeous, like gravel made of jet, menacing and baritone. I am put in mind of Tom Hardy from Taboo’s…. Dad! Dark comedy runs throughout their bleak history lessons of nineteenth century London, and it’s far from union jacks, gin and genteel patriotism. Andy plays the saw and Mark punks up a double bass for a delightfully slow song about ending up with your child stuffed! There’s even a delightful aside where he improvs the Jaws theme! Andrew snaps out gags from his lightning stand-up set that goes down brilliantly – “if you’re medicated and you know it clap your hands!” Never let it be said Goths don’t have a sense of humour! Their spooky new song – “This House Is Not Haunted” – is an appropriately dark ghost story with a twist. It’s a real pleasure to see it live. Of course, they must end triumphantly on Brunel, and the crowd absolutely goes wild for this Blamed For Nothing hit! That was a hard act to follow, but Abney Park are veterans and rise to the challenge. They’re technically brilliant, an expertly coordinated team of professionals, but my first instincts are that their complex and swirling music has been swamped by the aggressive ruckus of “The Men”. I’ve always cherished string music, and I adore their violin accompaniment – it’s so perfect at transporting you to the gorgeous and dangerous world of Abney Park. The musicians themselves are very mobile, roaming the stage and clearly in their element. I love watching a band thoroughly enjoy performing! I also linger appreciatively on the stage setup – their customized equipment turns the stage into a portal to their steampunk paradise. As I listen along, I find it difficult to distinguish the instruments and they seem to come across at the same level. Through bitter experience, I know the bass and percussion need additional strength to punch through the dead air in the Spa. Looking out at the packed venue, I can see the crowd are appreciative and cheering, but I also can tell they aren’t moving at all as much as for The Men. Captain Robert himself whips out a phone, spins and takes a quick selfie with the jubilant crowd. To witness this band is to see Abney Park effortlessly crossing genres, moving from heart-string tuggers to cabaret style hypnotic, evil, little numbers! “You guys having fun now?” the Captain shouts out… and of course, they roar considerably! 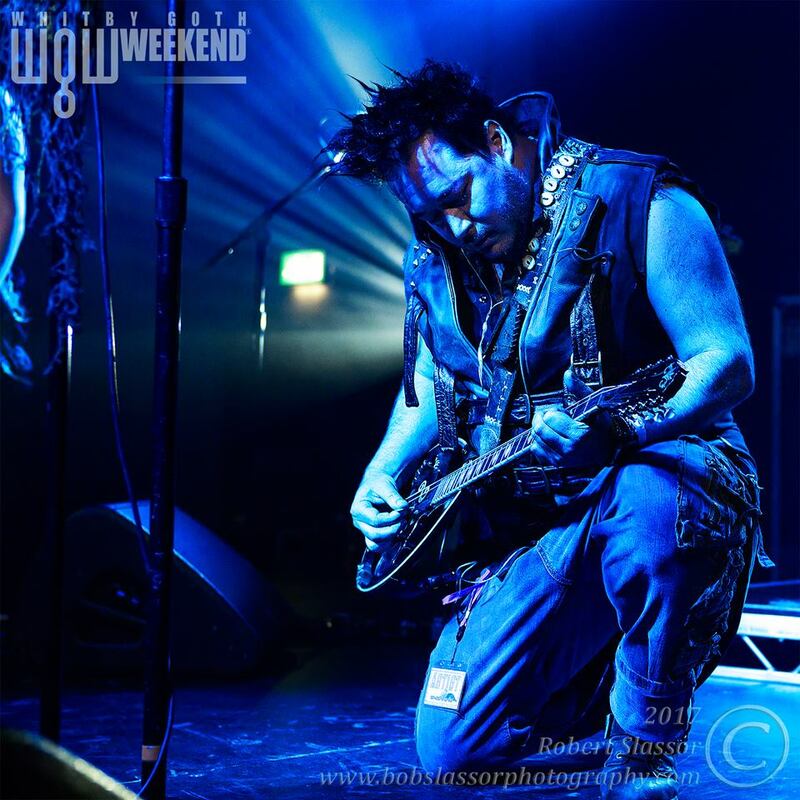 A guaranteed and successful crowd-pleaser, I still came away thinking Abney Park solidified their fans opinions, whilst upstart youths The Men won many new converts. Is there room on the block for a couple of steampunk champions? Although he is but one man, he has enough charisma to fill a stage! It is of course, Saturday’s headliner – the charismatic, outrageous and hilarious Voltaire. His Lyrics peppered with innuendo, delivered through the cheekiest smile this side of the Atlantic! He kicks off, conversationally as always, with a cover of “Music of the Night” from Phantom of Opera… and even managed to spice that ponderous stage classic right up! He also discusses the worldwide Voltaire Creative Empire, and talked about a visual novel he’s contributed the music to – he loved the artwork, every stroke! Volatire delivers just the catchiest songs, his voice is a syrupy and flexible sound that benefits from just the acoustic accompaniment. Then, it got really personal. His heartfelt reporting of his experiences with suicide utterly weld his audience to him through bitter shared experience, and leads perfectly into the defiant “Raised By Bats”. Voltaire is a consummate showman. Then, Voltaire moves into my own interests and asks the audience to cast their votes on sci-fi. The results are that Star Trek beats Star Wars, and that Doctor Who beats both! Not sure the Box Office bears that out, but it’s a great opportunity to segue into “Bigger on the Inside”! A delightfully naughty Doctor, could Voltaire be angling for a seat in the most famous time machine of all, er… time?! There are no surprises as we near the ending of this performance. The utterly beloved “When You’re Evil” is the crowning (morning) glory of his live performance – and always results in a stage full of adoring – and clumsy! – fans as the perfect choir. It’s a familiar sight, and yet a valiant personal touch that keeps Voltaire fans the most loyal in the world. A solid headline performance – as always! And so ends my review of Whitby Goth Weekend’s live line-up. My thanks to Bob Slassor Photography for the professional images, and to Cat On The Wall Zine for being able press comrades (and superior in many ways!). 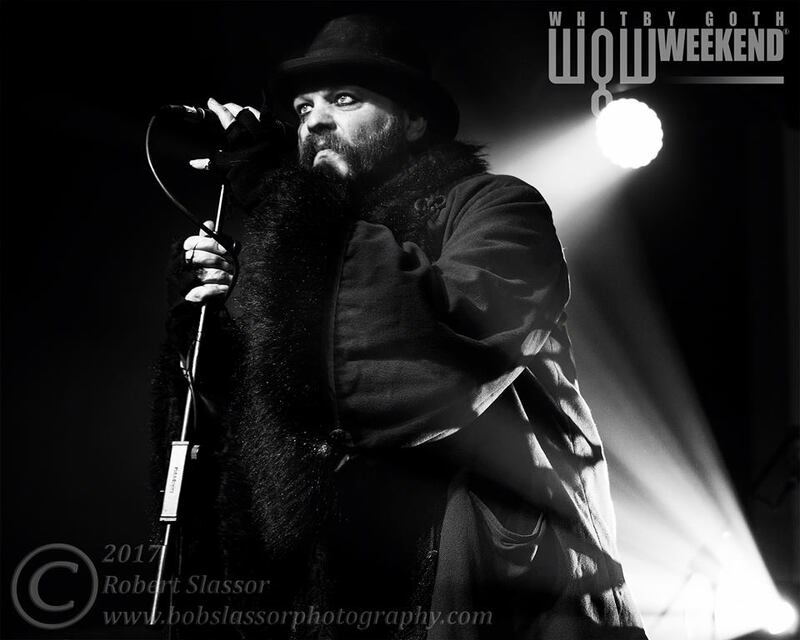 Finally, of course, I am grateful for the provision of press access by Whitby Goth Weekend, the leading UK Goth music event! 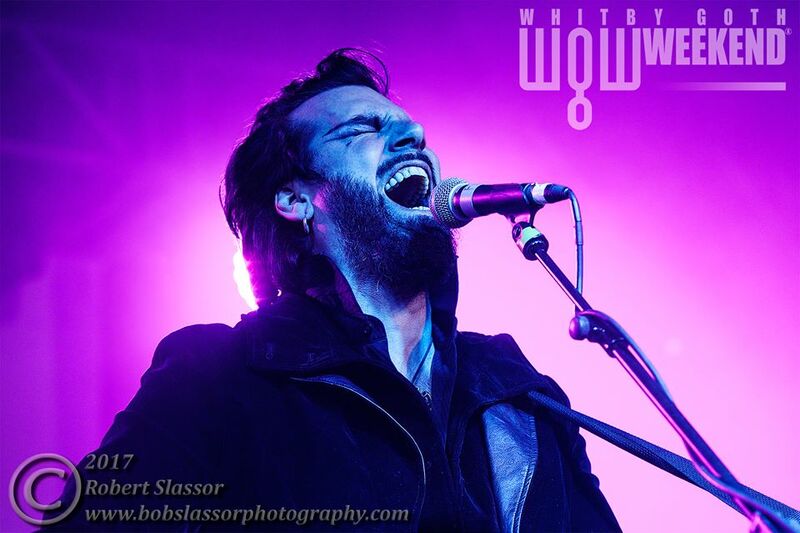 This entry was posted in Uncategorized and tagged bands, event, festival, links, music, review, Whitby Goth Weekend. Bookmark the permalink.